Nike has announced the launch of a first-ever self-lacing sports shoe, tying in to the brand's activity around the NBA London Games. The Nike Adapt BB shoe has a built-in power-lacing system and is able to adjust its fit automatically to the wearer or via Bluetooth on the Nike Adapt smartphone app. Using either the app or buttons located on the side of the trainer, the wearer is also able to input different fit settings in order for the shoe to adapt to different environments. The lights on the side of the shoe can also be adjusted to change colour via the app. 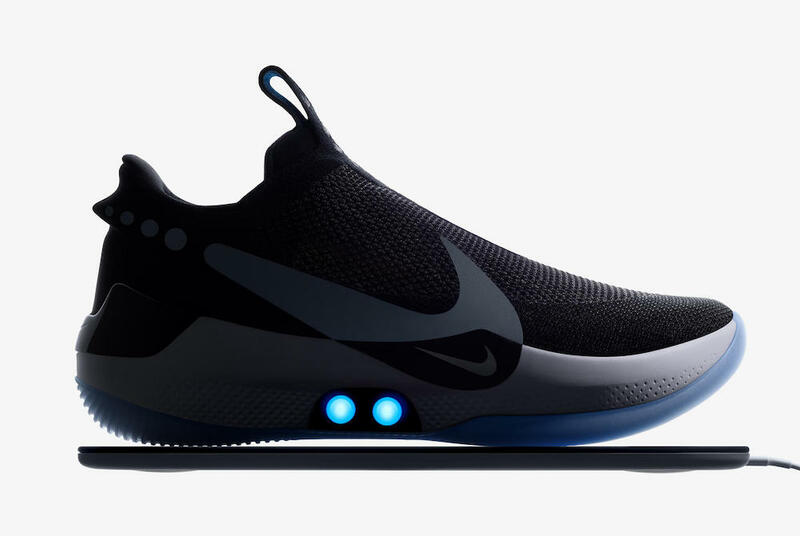 Nike claims the battery in the shoes will last for 10 to 14 days on a single charge, and can be charged wirelessly through the soles or on accompanying wireless charging pad. Designed primarily for the basketball market and athletes, the shoes are able to adapt as the foot swells, which can be up to half a size during physical activity. A custom motor and gear train senses the tension needed by the foot and adjusts accordingly to keep the foot snug. Commenting on the launch, Eric Avar, Nike's VP of Design Innovation said: "We picked basketball as the first sport for Nike Adapt intentionally because of the demands that athletes put on their shoes. The shoes will debut in the UK at NBA London with New York Knicks star Frank Ntilikina wearing the shoes against the Washington Wizards in London.